From a technical standpoint, Nu-Tek has a process which supports the polishing of light weighted substrates along with the metrology capabilities required to measure the substrates and determine their "0g" figure error. Often though, when it comes to space flight hardware heritage is nearly as important as the actual capability. 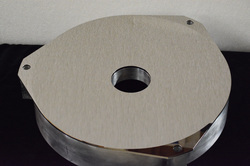 Nu-Tek has manufactured optics for successful NASA qualified space flight missions. There are currently Nu-Tek optics imaging across the solar system from the SECCHI coronagraphs on STEREO (Solar Terrestrial Relations Observatory) studying coronal mass ejections, to the Alice ultraviolet imaging spectrometer on New Horizons supporting the exploration and characterization of Pluto and beyond. Nu-Tek uses state of the art Single Point Diamond Turning equipment to manufacture metal, crystal, ceramic, and plastic optics with prescriptions from standard spheres and flats to aspheres with high levels of departure from best fit sphere. 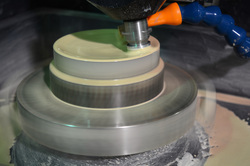 Our post polishing techniques can produce visible quality surface roughness and in certain materials, further improve surface figure error beyond the capabilities of the diamond turning machines. 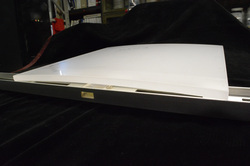 Custom features such as polished reflective face flats for parabola alignment and custom mounting features are routine, facilitate alignment in our customers systems, and provide extra capability with out significant extra cost. Nu-Tek routinely delivers custom optical assemblies, whether designed at Nu-Tek or build-to-print. Lens barrels and telescopes are common assemblies in our shop. 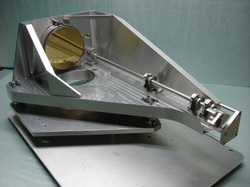 On-axis and off-axis Cassegrain, Ritchey-Chretien, and Dall Kirkham telescopes and laser beam expanders, for lab use or ruggedized for field or flight, are completed regularly. We have completed numerous custom IR Relay designs to interface legacy telescopes to new IR Cameras as well as several diamond turned telescope and spectrometer units. Nu-Tek has the experience and equipment necessary to manufacture, align, and assemble telescope optics up to Ø1500mm including meter-class Ritchey-Chretien, Cassegrain, or Mersenne telescopes. Our process can support light-weighted substrates, and our technicians have hands on experience fabricating this type of mirror dating back to our inception in 1987 which has enabled us to develop handling procedures to protect these delicate and high value substrates. Combining decades of experience in custom surface figure error metrology design with a catalog of available large aperture test optics and a series of interferometric and mechanically based metrology tools enables us to deliver custom solutions with low cost and high accuracy. We pride ourselves on our understanding of component and system level optical metrology and believe that metrology is the heart of the optical manufacturing process. Our opto-mechanical engineering team has experience designing and manufacturing complete optical sub-systems for use in a variety of environments including space flight, air born, land based, and laboratory environments. Our unique combined understanding of design fundamentals and manufacturing processes enables us to work with our customers to tailor design features and tolerances for manufacturability while maintaining system performance, shortening lead time and reducing overall system cost. Nu-Tek has been working with Spinel continuously since 2001. Spinel, or Magnesium Aluminate, is a pressed powder material that can be formed to near net shape. It has transmission from VIS into MWIR, similar to sapphire. It is sought out for its ballistic properties, used as transparent armor effecting a significant weight savings compared to the heavier bulletproof glass that sometimes overloads up-armored vehicles. It is also sought out for large hemispherical domes, where the material can, in theory, be pressed to near net shape, saving the time and expense of manufacturing large boules of material, then machining away the substantial quantity of excess material to yield the relatively thin dome.